The Wissahickon Robotics Program is an after-school activity designed to inspire young people to pursue careers in Mathematics, Science and Technology. The team also puts a strong emphasis on community outreach activities and charity. These activities bring communities together as students, parents, teachers, and industrial mentors work in partnership to achieve a common goal. Although the construction and programming of a robot is the central activity, our overall goal is to build people, not machines. This program was founded with the principal mission of student development and building community. 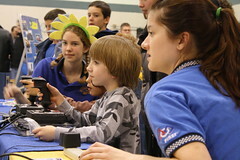 The mission of the Wissahickon Robotics Program does not end with the students on the various teams. We are an active organization which seeks to inspire students at every grade level. We make regular elementary and middle school presentations with the goal of getting students excited about technology and the value of pursuing their education to the fullest. We can also be found at community events, shopping malls, Philadelphia Science Festival, and the Philadelphia Museum of Art spreading the message that, “Science is FUN and that being intelligent is essential.” We work in partnership with neighboring school districts to allow their students to join our team. Our outreach programs are meant promote learning about science and technology. Some recent demonstrations have been Girls in Gear©, elementary school workshops, and Her World. We demonstrate at local events to educate the public about the value of the FIRST® program. We have gone to many demonstrations, including the Philadelphia Museum of Art, the Franklin Institute, the Farnborough International Airshow, and many elementary schools. The team has become very involved in local charity drives. Every year at Ramp Riot, the team collects cans of food for the Ambler Community Cupboard. We have also donated sports equipment for needy athletes, an estimate of 200 school supplies to children in Iraq, and donations for the family of a fallen police officer. The team helps other teams by donating to a neighboring school district so that they could start an elementary school robotics program. A 36 team competition hosted by WHS to benefit all FIRST® teams and open to the public. Thousands of people come to this off-season event every year. We do many activities designed to attract new engineers and students to the robotics program, like going to engineer society meetings. We provide advice, training and technical assistance for elementary school teams and rookie high school teams in both our area and internationally.